Feili, H., Besharat, R., Chitsaz, M., Abbasi, S. (2018). The impact of different leadership styles in successful implementation of knowledge management in organizations by structural equation modeling. 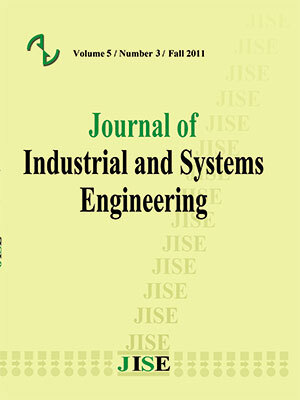 Journal of Industrial and Systems Engineering, 11(3), 1-22. Hamidreza Feili; Reihaneh Besharat; Mohammadreza Chitsaz; Shahrzad Abbasi. "The impact of different leadership styles in successful implementation of knowledge management in organizations by structural equation modeling". Journal of Industrial and Systems Engineering, 11, 3, 2018, 1-22. Feili, H., Besharat, R., Chitsaz, M., Abbasi, S. (2018). 'The impact of different leadership styles in successful implementation of knowledge management in organizations by structural equation modeling', Journal of Industrial and Systems Engineering, 11(3), pp. 1-22. Feili, H., Besharat, R., Chitsaz, M., Abbasi, S. The impact of different leadership styles in successful implementation of knowledge management in organizations by structural equation modeling. Journal of Industrial and Systems Engineering, 2018; 11(3): 1-22. 1Assistant Professor, Department of Industrial Engineering, Karaj Branch, Islamic Azad University, Karaj, Iran. In an era that in which the economy is in the core of knowledge aspect, knowledge is considered as a vital factor in maintaining the sustained competitive advantage of organizations. Today, the art and skill of management in organizations is moving towards changing into the art of "knowledge management"; and, leadership means providing suitable conditions and grounds in producing valuable knowledge via human force thought, and performing this task in a way that would encourage individuals in undertaking personal responsibility. The leadership factor plays a key role in successful implementation of knowledge management in enterprises and organizations; thus, in the present research, the authors have studied the relationship between knowledge management and leadership style as well as defining empowerment leadership style in knowledge management. The statistical population considered in this research consists of employees of Iran Export Credit Insurance Institute. The present research is applied in term of goal and description and correlation in terms of nature and methodology adoption. To study the relationship between variables, the regression analysis based on SPSS software, factorial analysis, modeling structural equations based on variance by using PLS software has been used. In line with research hypotheses, the correlation coefficients showed the positive and significant relationship between transformational and transactional leadership with knowledge management; and on Laissez-Faire leadership style, no significant relationship was confirmed between this variable and knowledge management variable. Ultimately, transactional leadership style was recognized as empowerment leadership style in knowledge management at this institute. Abdullah, R., Selamat, M.h., Sahibudin, S., & Alias, R.A. (2005). A Framework For Knowledge Management System. Journal of Knowledge Management. Available at: http://www.tlainc.com/article83.htm. March 2005. Abtahi, S H., & Kheyrandish, M. (2011). Knowledge Management with Organizational Ground Approach, Tehran, Modiran Emrouz Publication, 198-206. Abtahi, S H., & Salavati, A. (2006). Knowledge Management, Tehran, Peyvand Nou Publication, First Edition. Afjeh, S A. (2001). Philosophical Fundamentals and Theory of Organizational Leadership and Behavior, Tehran, Human Sciences Books Study, and Development Organization (SAMT), Human Sciences Research and Development Center. Akhavan, P., Olyaee, A., Dastranj Mamaghani, N., & Vaseghi, F. (2010). Development of the Processes of Knowledge Management Cycle based on the Factors Effective on Knowledge Management Success, Journal of Science and Technology Policies, Third Year, 2. Ali, N., Babar, M.A.A., & Bangash, S.A. (2011). Relationship between leadership styles and organizational commitment among medical representative of national and multinational pharmaceuticals companies. interdisciplinary Journal contemporary Research in Business, 2(10), 529-524. Allameh, S.M., Zare, S., & Davoodi, R. (2011). Examining The Impact of KM Enobers on knowledge management processes, procedia computer science, 3, 1211-1223. Almarabeh, T., Abuali, A., Alsharrab, S., & Lasassmeh, A.A. (2009). Value Chain Model Knowledge Management. International Journal of Recent Trends in engineering, 2(2), 196-198. Arabi, S M., & Mousavi, S. (2010). Knowledge strategy. Tehran, Mahkameh. (in Persian). Azar, A., Gholamzadeh, R., & Ghanavati, M. (2012). Structural Modeling in Smart PLS Software Application Management, Tehran, Negah Danesh Publication. Bushra, F., Usman, A., & Naceed, A. (2011). Effect of Transformational Leadership on employee's job satisfaction and organizational commitment in Banking sector of Lahore (Pakistan). International Journal of Business and Social Science, 2(18), 261-267. Carlos, J., & Rivera, A. (2011). Las Comunidades De Practica Y La Gestion Del Conocimiento.Un Studio Desciptivo. Revista internacional Administraction & Finanzas, Vol. 4, N. 1. Chuang, Ch., Jackson, S., & Jiang,Y. (2013). Can Knowledge-intensive Teamwork Be Managed? Examining The roles of HRM System, Leadership and Tacit Knowledge. Journal of Management, Published online 13 March 2013. http://jom, sagepub.com / content /early 2013. Danaeefard, H., & selseleh, M. (2010). Measuring knowledge management cycle: Evidence from Iran. European journal of Scientific Research, 41(2), 297-309. Davis, K. (1972). Human behavior at works (4th ed.). New York: McGraw Hill. Ehsanfar, G. (2011). Relationship between Transformational Leadership, Creativity and Organizational Innovation at Private Insurance Companies of Iran, M.A. Thesis, Business Administration Field (Insurance Major), Supervisor professor, Dr. Nader Mazloumi, Allameh Tabatabaei University, Faculty of Accounting and Management. Ostady Jafari, H. (2012). Prioritization of Key Factors in Knowledge Management System Implementation, M.A. Thesis, Supervisor Professor, Dr. Hassan Ghasemi, Allameh Tabatabaei University, Faculty of Management and Accounting. Ghasemi, B. (2012). Management of Organizational Behavior. Tehran: Sepahan, 477-438. Ghiasvand, A. (2012). Using SPSS software to analyze the data. Tehran: Loya. Girdauskiene, L., & Savanevicience, A. (2012). Leadership Role implementing knowledge transfer in the Creative organization. international conference on leadership, Technology and innovation management. Procedia- Social and Behavioral Sciences 41, 15-22, Available at www.science direct.com. Goldoni, V., & Olivira, M. (2010). knowledge management metrics in software Development companies in Brazil. Journal of knowledge management, 14(2), 301-313. Gregory, B.T., mates, K.N., & Gregory, S.T. (2011). An exploration of perspective taking as an antecedent of Transformational leadership behavior. leadership & Organization Development Journal, 23(8), 807-816. Javadein, S R. (2005). Comprehensive overview of the theory of management and organization. Tehran: Look knowledge. Karakitapoglu, A., & Gumusluoglu, L. (2013). The bright and dark sides of Transformational leadership vs. nontransformational leadership. Leadership, 9, 107, Available at: http://lea sogepubl.com/ conteut/9/107. khasawneh, S., Omari, A., & Abu-Tineh, A. (2012). The Relationship between Transformational leadership and organizational commitment. Educational management administration & leadership, 40, 494, originally published online 11 may 2012 Available at: http://ema.sagebub.com/content. Luthans, F. (1996). organizational behavior. (Sarmad Ali translation). Volume II, Tehran: Iranian banking institution, First Edition. Mohammad Moghaddam, Y. (2012). Disciplinary knowledge management model of police organization. Doctoral thesis Public Administration (human resources orientation), Supervisor: doctor Ghorbanzadeh way of Allah, Allameh Tabatabaei University, Faculty of Management and Accounting. Momeni, M. (2008). Statistical analysis using SPSS. Tehran: book publishing. Mooghali, AR. (2003). Iranian official doctoral thesis transformational leadership in organizations. Allameh Tabatabai University, Faculty of Management and Accounting. Moorhead, J., & Griffin, R. (1997). organizational behavior. (Translated by Seyyed Mahdi Alwan and GH Memarzade). Tehran: Pearl, Second Edition. Sajadi, Z. (2011). Examine the relationship between spiritual intelligence and moral intelligence and transformational leadership. Master's thesis, Supervisor: doctor Ghorbanzadeh way of Allah, Allameh Tabatabaei University, Faculty of Management and Accounting. Sanjagh, M E. (2002). Analysis of the nature and dimensions of transformational leadership. Journal of Humanities University of Al-Zahra, the eleventh year, numbers 37 and 38. Sarmad, Z., Bazargan, A., & Hejazi, E. (2003). Methodology in Behavioral Sciences. Tehran: awareness, Seventh Edition. Skaran, U. (1381). research method in management. (Translated by Mohammad Sabian). First Edition. Tehran: State Management Training Center. Stari, M. (2006). The relationship between the learner's knowledge management system of organizational intelligence Vmvlfh (case studies: Esfahan Steel Company). Selected Paper Conference on Knowledge Management, Issue 2. Zagoršek, H., Dimovski, V., & Škerlavaj, M. (2008). Transactional and Transformational leadership impacts on organizational learning. Journal for East European Management Studies, 14(2), 144-165.